Companies often think R&D is the only path toward innovation, while some think innovation focuses only around the performance of products and services – features, benefits or new offerings. But ‘innovation’ goes well beyond these things. Peak Performing organisations with a clear purpose and objectives continually try to create greater value, and this requires innovation from across its entire business and operating model. • Innovation without value tends to focus on the technical aspects of innovation which may lead to products/services that customers are unwilling to pay for. We recently looked where over 150 of our current and previous clients were putting their innovation energy when we first met, and themed them against the 10 Types of Innovation model. Then, we compared that with their priorities after going through Peak Performance Strategy, where achieving clarity and alignment of purpose, objectives and customer value was at the core. Later in this blog I’ll share what we learnt, and questions you could ask of your own organisation, but first, here’s a snapshot of what the 10 Types of Innovation framework is. We’ve included a few examples, and some come from Mike & Helga’s book Sustainable Peak Performance (SPP). Developed by Doblin and now owned by Deloitte, the 10 Type of Innovation are split into three areas. To the left is ‘Configuration’, how the company is organised to make a profit. At the centre is ‘Offering’, which contains the core product elements. And to the right is ‘Experience’, how the company interacts with its customer. You might like to think of the left being ‘back-stage’ and the right being ‘front-stage’. How the organisation turns its value into profit. Businesses changing their revenue model to subscriptions is common example of this nowadays. Or, exercise equipment companies leasing their machines (with maintenance included) to gyms rather than charging the lofty cost of purchasing them outright. Given gym membership is about monthly fees (levelled cash flow), it makes sense as a supplier to align with their customers’ revenue pattern. The value created by working with others. Businesses are connected more than ever, and it’s becoming essential to work well with others when operating across markets and geographies. Ngati Porou, the Iwi from New Zealand’s East Coast, and Air New Zealand, now have a formal partnership to develop tourism experiences, grow carbon credit benefits, enable commercial networks and even create talent sharing opportunities. Another example comes from the late-2000s. Mike helped the economic development agency New Zealand Trade & Enterprise define their own purpose and strategy – ‘Growing companies bigger, better faster, for the benefit of New Zealand’. For them to achieve it, they’ve created a network of advisors, connections and ignited collaborations among exporters, using the mantra ‘Know how, know who’. It’s been a privilege to be a part of their advisor network for over a decade. How you organise the talent and assets within your company. When done well, these are very hard for competitors to copy. Zappos, and its Holacracy, would be structural innovation example. Remember, when thinking about talent and resources, do you have a clear set of values or beliefs that underpin your approach to culture, talent managing, reward and recognition, etc? How a company goes about producing its products and services – its core operations. The methodology ‘Lean’ would apply here, but be careful that your ‘process innovation’ doesn’t lead to stripping value out of the business, and it being perceived as a cost cutting exercise. The quality, features and capability of your products or services. This is often considered the total sum of innovation, and revolves around the R&D department. Comvita, a manuka-honey based business (SPP case study and previous client), took their product through the time-consuming and expensive international medical registration process and now have honey-based wound care dressings to treat burns and ulcers around the world. Their Medihoney can be used anywhere from third-world villages to state-of-the-art medical facilities. How you create additional value by combining multiple products, or even teaming up with other organisations, to create significantly more value. Microsoft bundle a variety of specific products (Word, PowerPoint, etc) into a system designed to deliver greater productivity in the workplace. Or Dilmah (SPP case study), has gone beyond just boxes of tea bags and have collaborated with mixologists at cocktail bars around the world to deliver different experiences for consumers. How you connect with your customer, either directly or indirectly. Or put another way, by what means do you deliver the value through to your customers and consumers? In our blog about the 8 ways to create an enduring business model, we talk about excellent channels to market. Your brand is the perceptions in the minds of customers and consumers about your products, services, and behavior. Your brand represents the values you stand for, and should encourage opportunities to innovate. New Zealand clothing company Untouched World (SPP case study) created a charitable trust that has had a profound effect on the company. In 2008, the trust’s work helped the company win the right to put the UN Decade of Education for Sustainable Development Education logo on its Untouched World products – an enviable marketing boost for the company’s global profile. Outdoor equipment company Patagonia (SPP case study) has a mission to build the best product, cause no unnecessary harm, and use business to inspire and implement solutions to the environmental crisis. What better way than to encourage change at a political level. 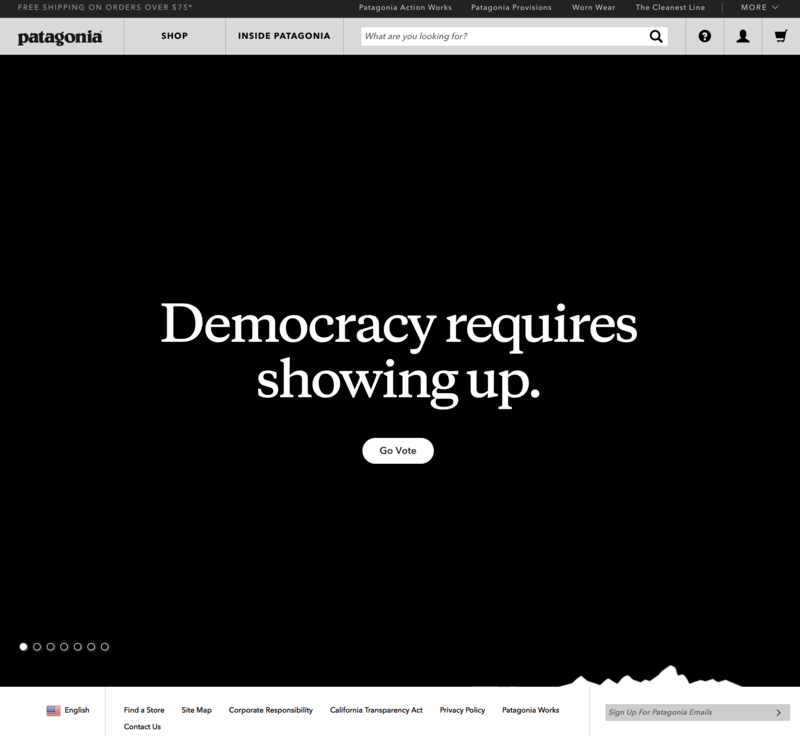 Here is their homepage prior to the US mid-term elections! How you understand and then leverage the desires and needs of your customers. When was the last time you sat down with your customers/consumers and asked how they live their lives and the role your goods fit? More and more F & B businesses are doing this – even sitting in people’s living rooms chatting or watching how they cook their meals. Cool! 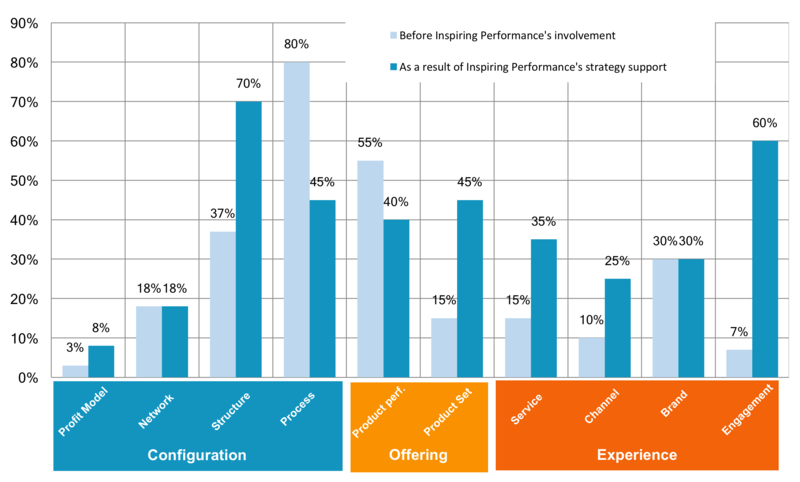 Creating unbeatable value proposition/s is a part of Peak Performance Strategy. That is, the fundamental value created from your goods, from the perspective of the customer and consumer. Innovation needs to come from all these, and often in tandem. To be successful you can’t think innovatively in just a part of your business. Your purpose should be the lens that leads to innovation across everything you do – assuming your purpose is worded correctly and encourages you to expand your horizon of business potential. • Product Performance – In 1985 they innovation by signing then rookie basketball star Michael Jordan to endorse the Nike brand. • Channel innovation – In 1990, Niketown was launched to present ‘retail as theatre’. • Product System – Nike launched Nike+, the software that integrates into the sportswear range, and allows runners and athletes to track their activity. It also integratesd with Apple products in a Network innovation. Strategy is about ‘choices’, and having clarity on what you will focus on to achieve your goals. When we begin working with a new client, we hear how they’re ‘working on’ their business. In some cases, there wasn’t one clear set of priorities, but we put all these things against the 10 Types of Innovation framework (the light-blue bars). 4. How to maintain momentum (operating model). When comparing the ‘before’ and ‘after’ bars, some interesting themes became clear. 4. Organisations too often feel they should just focus on improving existing products/services, rather than exploring how to leverage/exploit other opportunities in their industry’s value chain. 3. Gaining clarity across the entire organisation of its priorities (rather than in the head of just a few) is critical. Once executive teams own the need for, say customer engagement (e.g. human-centered design), or structure (e.g. governance & decision rights), they also co-own the importance of investing in it. We’ve covered a lot of content in this blog. We encourage you to think about ‘value innovation’ and not try to become innovative because you think it’s cool to do ‘new stuff’. We’d love to hear about the innovations you’ve made, or new ways of working to better live your purpose. If you’d like a hand with purpose or value-innovation, get in touch.